I don't remember when or how the show was on, but I was able to immerse myself into Pixar's Ratatouille. In doing so, I decided that I wanted to make Ratatouille. Remy style. The super thinly sliced vegetables that rat put on the table looked delicious.... and, damn it, if a rat can make it, so can I! So the first thing one needs when making such a fine dish is a hundred dollar Cuisinart Processor/Slicer/Chopper. Am I right, girls? Am I right? I mean, hello, anyone can use a knife --- but how much cooler is a Cuisinart Processor/Slicer/Chopper than a boring, old paring knife. Okay, so I also could have purchased a cheaper mandolin, but whatever dude. I also made a scrumptious cheesecake with my super-awesome Cuisinart Processor/Slicer/Chopper. So there. I did a lot of research online. 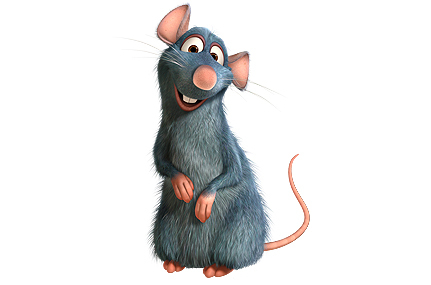 I did not want to make a traditional ratatouille, I wanted Remy's mouth watering vision. And while it would have been more authentic to make the original recipe in which the movie's dish was based on, that looked far too complicated for me. Luckily I found a wonderfully delicious looking, simple recipe to follow from the Smitten Kitchen. It took me several weeks before I actually got around to making my wonderful new recipe. I was going to make it one week, and I was too lazy to go to the store. I was going to make it the next week, and I even got my booty off the couch and went to the Modesto Farmer's Market for some fresh ingredients, only to be thoroughly disappointed by the selection. Finally, this last weekend, I decided I was going to do this whether I liked it or not. We went to our local neighborhood Safeway and got everything we needed. Okay, wait, no we didn't --- we forgot Parchment Paper. Super lame. So we went to Raley's two days later and got Parchment Paper, crusty french bread and goat cheese to top it off. Once you got the hang of it, the dish was really easy to make. We simply cleaned our vegetables, and put them in my handy-dandy Cuisinart. This left me with beautifully congruently sliced vegetable rounds (minus the small bits that fell sideways and left me with longer strips as opposed to quaint circles.) We then prepared the pan with tomato puree, onions and garlic and carefully arranged the zucchini, yellow squash, eggplant, and tomatoes just as Remy had in the movie. We baked it up a bit. Made some whole wheat couscous, and a little salad --- and Viola! A beautifully arranged meal. It was just as delicious as it was purdy. And what was even better is that the ugly ol' leftovers were just as, if not even more mouth-watering than it was originally. And that is a lot, coming from a girl that openly dislikes a majority of leftovers. I want the recipe! That looks delish, and I am trying to get Ken to try more vegetarian options.